Hoping to beat an "early turn-in" deadline today, backers of I-28, an initiative that would allow for a regulated system of dispensaries, turned in signatures at the secretary of state's office Thursday. Under Oregon's current medical marijuana law, only patients or their designated caregivers can produce their own medicine. 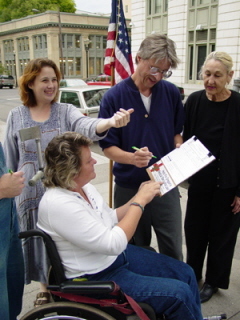 Organized as the Coalition for Patients' Rights 2010, backers need 82,769 valid signatures to make the November ballot. They have collected more than 110,000 signatures, leaving a significant cushion to account for possibly invalid signatures, though not a comfortable one in the world of initiatives. But even if I-28 doesn't come up with enough valid signatures after this week's hand-in, initiative backers still have another five weeks to gather more before the July 2 deadline. It now appears extremely likely that the dispensary initiative will go before Oregon voters this fall. "We think we are pretty close to having enough valid signatures." said John Sajo, director of Voter Power, the group organizing the petition drive. "When we drafted the original Oregon Medical Marijuana Act, we didn't include provisions for dispensaries because federal law prohibited that. But now that the Obama administration has indicated that they will allow states to regulate medical marijuana, Oregon needs to create a regulated system so every patient can access quality controlled medicine," he said. The Oregon Medical Marijuana Program now has more than 36,000 registered patients, but unless they can grow themselves or know someone who can, they must resort to the black market. I-28 would allow regulated dispensaries to sell medical marijuana to patients.